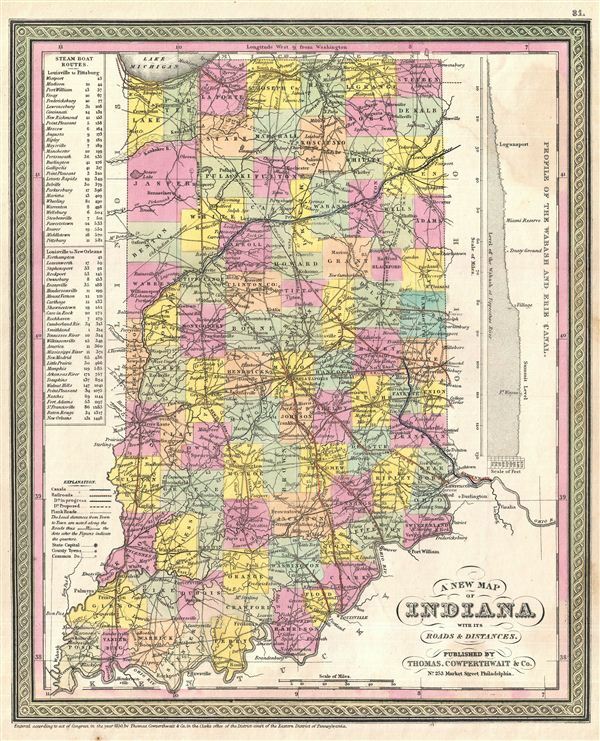 A fine example of Thomas Cowperthwait and S. A. Mitchell's 1854 map of Indiana presenting a profile of the Wabash and Erie Canal along the upper right border. Indiana's many canals and railroad lines are highlighted in blue and orange, respectively. Steam Boat Routes with distances are presented in tabular format along the border's upper left part. The whole is engraved and colored in Mitchell's distinctive style with green border work and vivid pastels. Political and topographical features are noted and color coded with elevation rendered by hachure.